VQuad™ Software Ver 9.8 | VQT Software Ver 7.3 | WebViewer™ Software Ver 5.7 | Download Now! Communications is dramatically changing as mobility and IP technologies such as LTE, Advanced LTE, WiMax, 3G, and Broadband Internet lead this transformation. As these technologies are rolled out, basic voice/data quality will ultimately determine the fate of carriers and end equipment manufacturers. Using GL’s VQuad™, voice, data, as well as video quality can be tested simultaneously on a wireless or wired network. Since the GL’s Voice Test solution is network independent, all networks are supported including 3G, 4G, WiMax, LTE, and Advanced LTE. GL's NetTest VQT app, supported on rooted Android devices, supports both manual and automated testing of Voice Quality within the network. 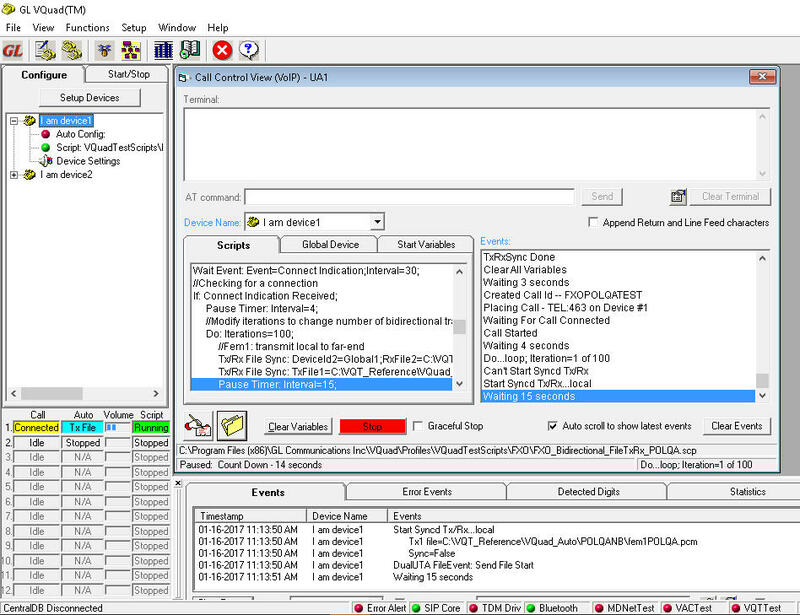 The GL NetTest VQT app includes features to place and receive calls over the network along with Play and Record voice over the established call. The call control functions and ability to send/record voice (for voice quality analysis) can be run manually from the app, automated from the app (using predefined scripts) or automatically and remoted using VQuad™ Scripting. 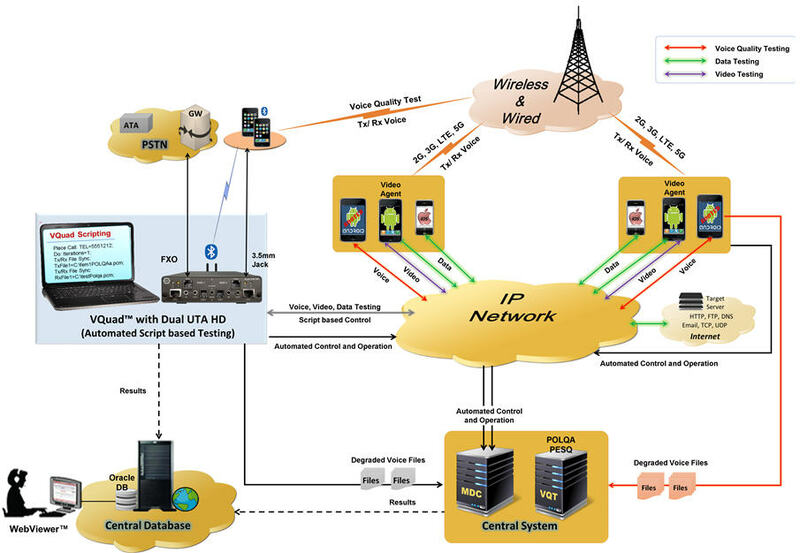 Using this solution, testing can be accomplished between two rooted Android phones (both running the NetTest VQT app) or between the Android phone and any device connected to GL's VQuad™ with Dual UTA HD. 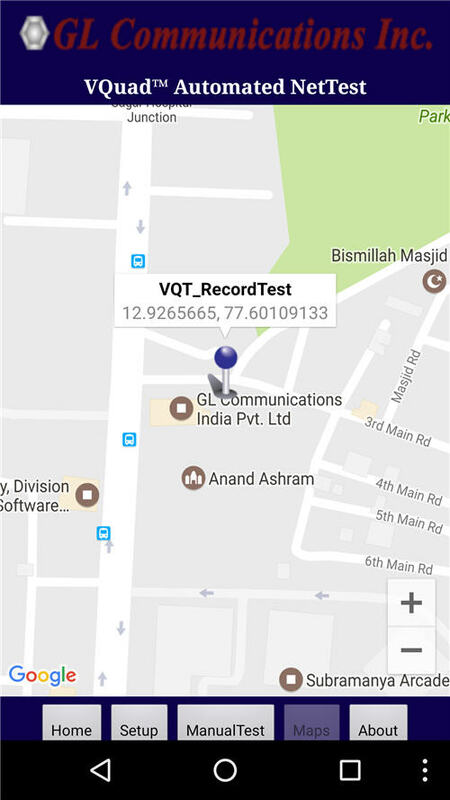 The NetTest VQT app stamps all results with GPS location for plotting within Google Maps as part of the GL WebViewer™ solution. 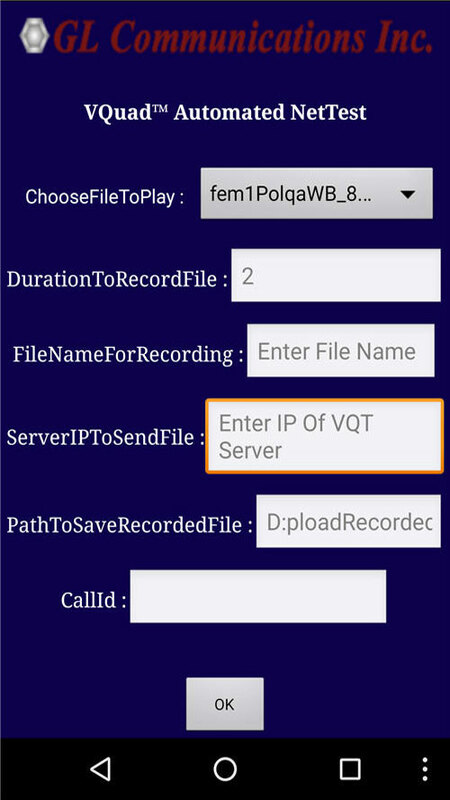 All recorded voice files, whether recorded at the NetTest VQT app (on the Android phone) or recorded at the VQuad system, are automatically transferred to the Central VQT system for analysis using VQT POLQA (ITU-T P.863) or VQT PESQ (ITU-T P.862) algorithms. All results associated with the VQT analysis as well as the call control events are transferred to the Central Database and accessed using GL’s web-based WebViewer™. GLNetTest solution optionally provides Video Quality Testing supported on Android, PC and Linux based clients (end points). GLNetTest app on mobile devices initiate, control, and perform the entire video conferencing testing with the support of a Video Controller/Server and Video Clients (Agents). NetTest solution provides automated data testing on Mobile Devices (Android and Apple) and a PC internet connection. Automated data testing includes TCP, UDP, HTTP, VoIP, Route, FTP, DNS, SMS, UE Info, SIM Info, and Phone Info test types. Video and Data Tests can be run directly from the Android phones using the GLNetTest app, or from the VQuad™ interface. Both manual and automated tests are supported using the flexible and versatile VQuad™ scripts. The Data tests can be performed while also running Video Quality Testing. In other words, if the network supports both Video and Data simultaneously, GL’s solution can support and provide valuable information with regard to data and video network quality. Voice testing is network-independent and is supported on, 4G LTE, Advanced LTE, 3G WiMax, Femto Cells, WiFi, and upcoming 5G. Supports voice quality testing on rooted Android devices with support for Playing and Recording voice files during an established call. VQuad™ scripting, when connected to the GL NetTest VQT app, provides automation, mobility, remote accessibility. GLNetTest mobile application is also available for both Android and Apple IOS devices (iPhone/iPad) supporting manual and automated Video and Data testing. VQT mobile application functionalities include place call, answer call, send and record voice over established call. Recorded files are transferred to the VQT central system for analysis. 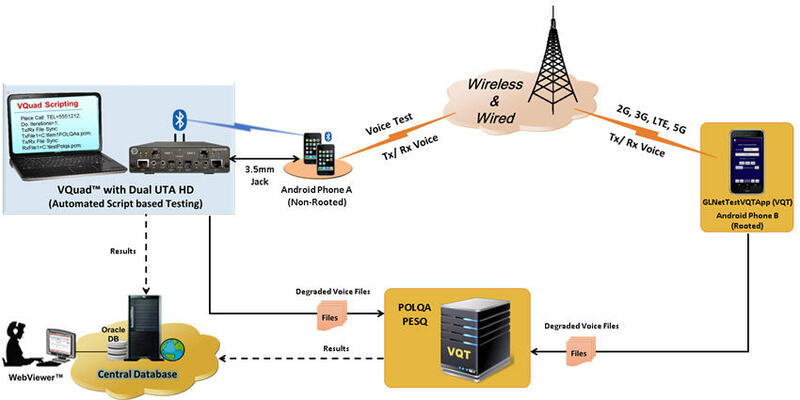 As depicted in the figure below, a call can be established between the non-rooted Mobile phone (or any device connected to the Dual UTA HD) and a rooted Android phone running the GL NetTest VQT app. The non-rooted Android phone is connected to GL’s Dual UTA HD via Bluetooth or wired headset (3.5mm jack). The call can be initiated from either side (VQuad™ or GL NetTest app), and either manually or automatically (using the VQuad scripting). Once the call is established, voice can be transmitted from either side while the other terminal records voice to a file (degraded). Different files can be selected for transmit including a variety of languages and both Male and Female (user can also send custom voice files to the GLNetTestVQT app). Both sides of the call can be controlled by the VQuad™ software for fully automated testing. All recorded voice files are automatically transferred to GL’s VQT Central system for analysis using POLQA/PESQ algorithms. The VQT results are sent to the Central Database where the results can be accessed using WebViewer™. A call can be established between two rooted Android phones, both running the GL NetTest VQT app. 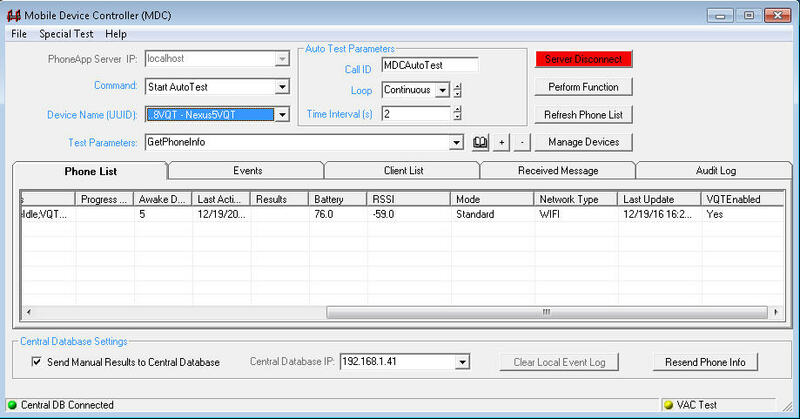 The GL NetTest VQT app can generate the call manually, automated, or remotely from the VQuad system. Once the call is established, voice can be transmitted from either side while the other terminal records voice to a file (degraded). Different files can be selected for transmit including a variety of languages and both Male and Female (user can also send custom voice files to the GLNetTestVQT app). Both sides of the call can be controlled by the VQuad software for fully automated testing. 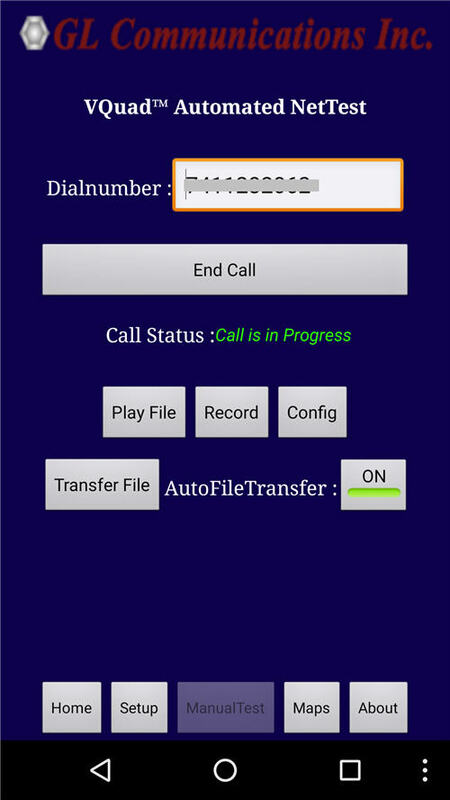 GLNetTestVQT Android application is used to play (send pre-recorded voice pcm files) or record (record incoming audio) audio files over established wireless calls. Available voice test functionalities include Place Call, Answer Call, Play Voice File, Record Voice File, and Transfer Files to the VQT Central System. Users can play a variety of predefined POLQA Reference files. During Recording, the user can specify the filename as ell as the length of the recording. The recorded files can be transferred to the VQT server by configuring the VQT Server IP address and directory settings. The recorded files are automatically transferred after completion of each file recording to the configured VQT Server location. GL NetTestVQT app includes Map option to automatically plot VQT Record and Play Voice Test on Google map indicating the co-ordinates and the test running. GL’s Mobile Device Controller (MDC) provides the necessary connection from the GL NetTest VQT app for automated control and operation. The MDC communicates to the mobile devices while accepting commands from VQuad™ and sending test results back to VQuad™. The Voice Tests can be remotely started irrespective of where the mobile device is located since all communication is IP based. The VQuad provides full automation of the entire test, controlling both ends of the call, using VQuad Scripting. Using the GL NetTest VQT app without VQuad supports limited automation of the voice testing. The automated test results with VQuad based CallID and GPS location are sent to the Central Database and accessed by WebViewer™. VQuad™ with Dual UTA HD can connect to multiple devices on variety of network Wireless (Bluetooth®, Wi-fi, 3G, 4G, LTE, PTT), VoIP, Analog, and TDM, practically allowing any end-point interfaces to be tested for voice quality. The Dual UTA HD includes interfaces for mobile device connectivity via Bluetooth and 3.5mm jack and also analog FXO interface to connect to any PSTN, ATA, and next generation Gateways supporting Voice testing. VQuad™ can automate Voice Test and control any connected mobile device on the network via MDC. VQuad™ sends commands directly to the MDC for initiating the Voice Test on mobile devices running GLVQTNetTest app. GL’s VQuad™ Scripting, portability for mobile drive testing, remote accessibility, analysis and centralized data retrieval are just a few attributes of GL’s next generation Voice, Video, and Data Testing solution. VQuad™ scripting can send commands to the MDC for initiating Voice Test on any connected Mobile Device. Supports conditional statements along with user-defined variables. Near-end VQuad™ device can control the far-end VQuad™ device via a TCP/IP connection. Easily transfer scripts from one VQuad™ device to another. The following figure depicts making call from one VQuad FXO device to other phone (Android phone w/ VQT app) in the network. GL's Voice Quality Testing (VQT)software supports the next-generation voice quality testing standard for fixed, mobile and IP-based networks using POLQA (ITU-T P.863), PESQ (ITU-T P.862), PESQ LQ / LQO (P.862.1), and PESQ WB (P.862.2). GL VQT can be configured to automate or to manually perform the voice quality algorithms on the recorded voice files in comparison with the reference files. The results of the VQT algorithms, POLQA, and PESQ LQ/LQO/WB are displayed both in tabular format as well as graphically. Additional analytical results are displayed as part of the assessment such as MOS, E-Model, Signal Level, SNR, jitter, clipping, noise level, and delay (end to end as well as per speech utterance). All results are saved to file and database for post processing viewing along with sophisticated searching on the results within the VQT application and using the WebViewer™ (remote and local access). The Voice test results from VQuad™, and VQT are automatically sent to the Central Database where the results can be viewed/queried using the GL WebViewer™ (web browser). 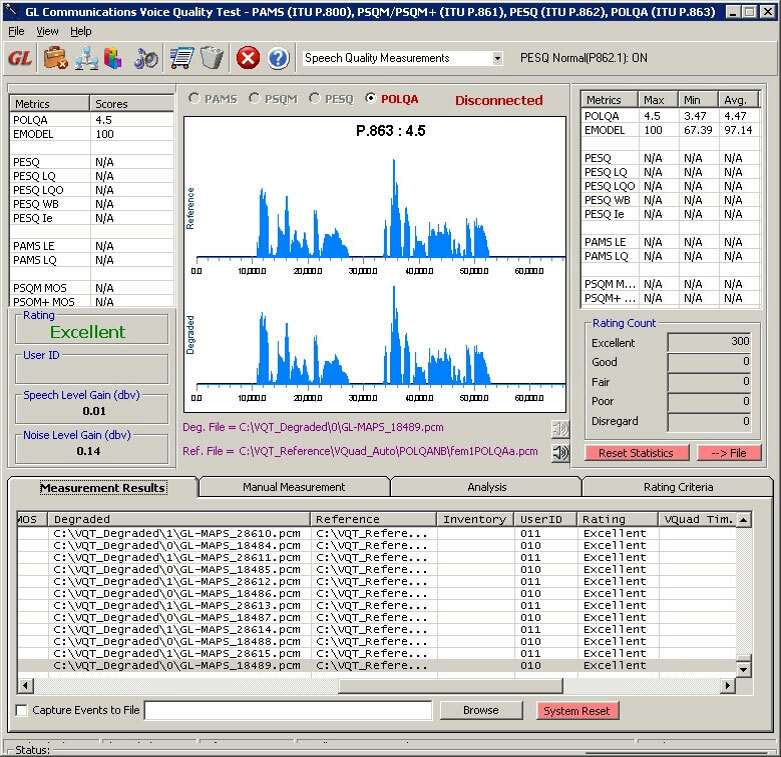 The results sent to the central database include, POLQA Score, EModel (R-factor), Speech Level Gain (dB), Noise Level Gain (dB), Jitter(ms), Delay(ms), PESQ, PESQ WB, PESQ Offset(ms), along with a variety of analytical and quality metrics. Results can be output to file or custom reports.